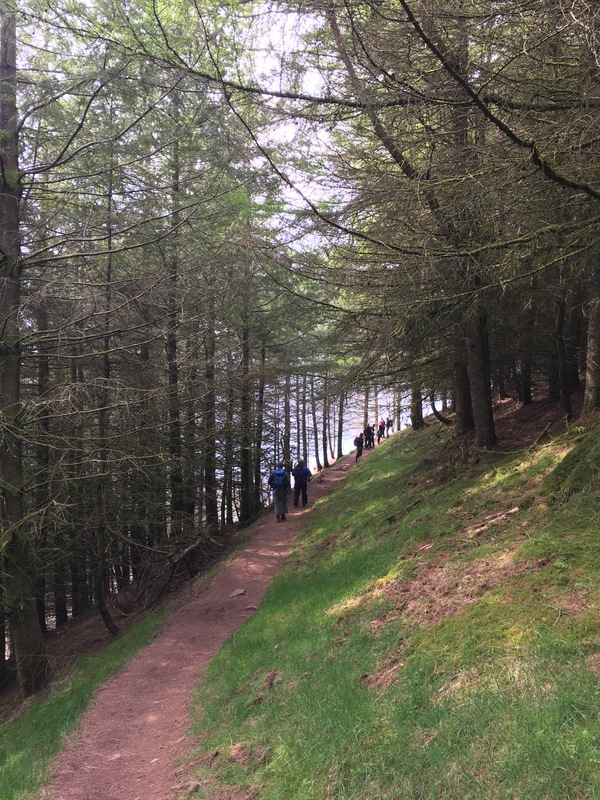 There has always been a walk around one of my favourite lakes in the Lake District. 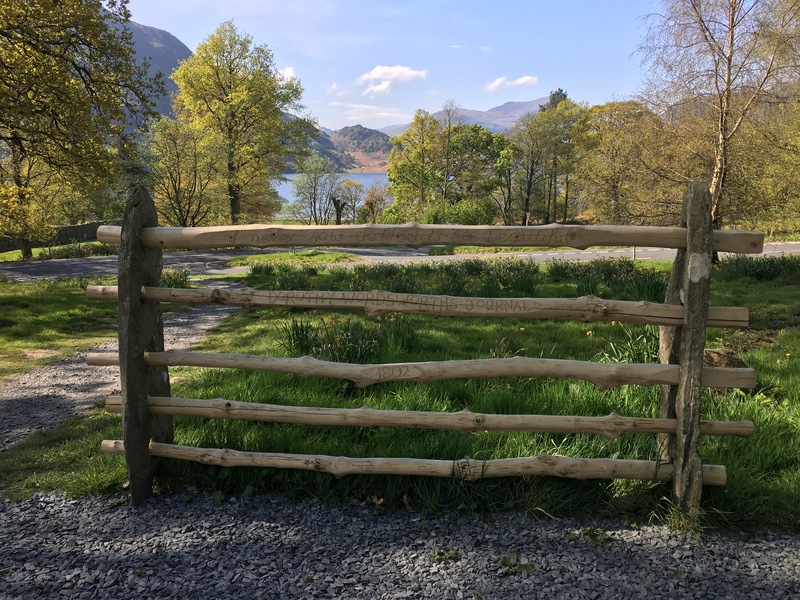 In recent years the much welcome addition of a proper pathway and steamer stop at Aira Force has made it more accessible, plus you don’t take your life in your hands walking down the busy road. 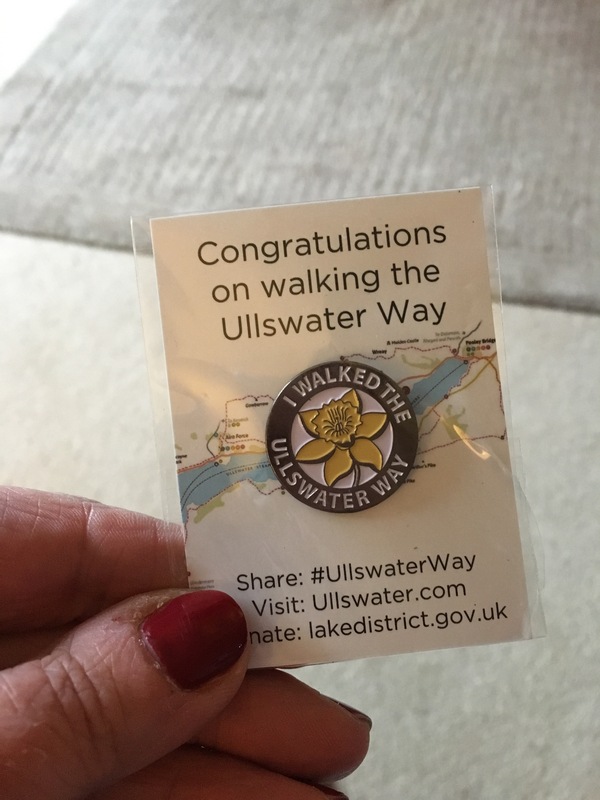 After the devastating floods in December 2015, in order to promote the area, the Ullswater Way was born being officially opened in April 2016, a 20 mile walk around this stunning lake. 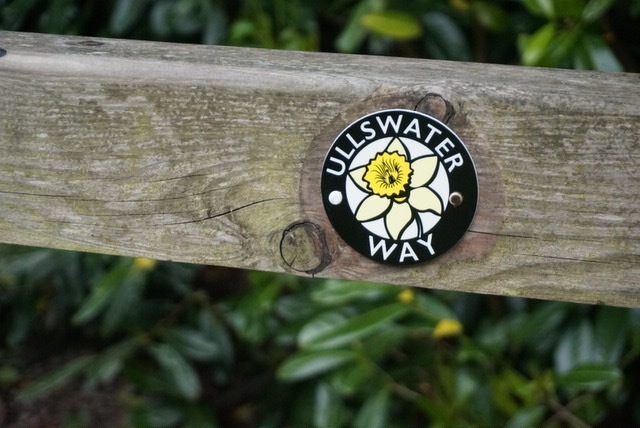 The path’s symbol, used for waymarking, has a picture of a daffodil; it was on the shore of Ullswater that William Wordsworth saw the flowers which inspired his well-known poem “I wondered lonely as a cloud”, often known simply as “Daffodils”. The walk can be done in a one off or splits down into much easier stages. Pooley Bridge to Aira Force, Aira Force to Glenridding, Glenridding to Howtown and Howtown to Pooley Bridge. Taking advantage of the Steamer to transport you back to your start point. I love going on the Ullswater Steamers, the boats are beautiful and the scenery wow it speaks for itself. 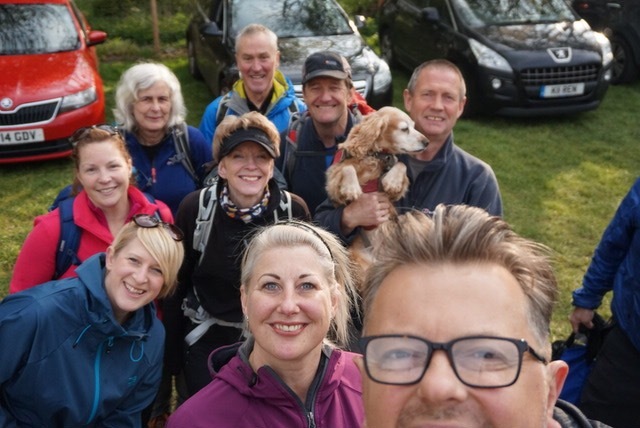 After as group message being sent out and doing the rounds, 10 of us turned up to take on the Ullswater Way. The weather was kind though a little windy. We decided to do the walk anti clockwise from Pooley Bridge. From Pooley Bridge the walk passes the Roman fortlet of Maiden Castle and Watermillock church, the paths were clear to follow and it was nice to see Ullswater from a different perspective. 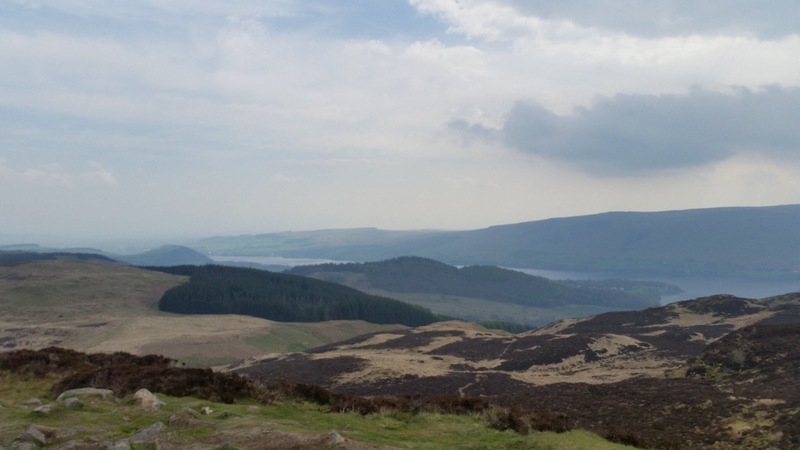 There is an optional ascent of the wainwright Gowbarrow Fell, to reach Aira Force. Some of the group went up this way, I didn’t, my legs were still feeling the effects of running the London marathon the week before. The views down Ullswater were breathtaking. 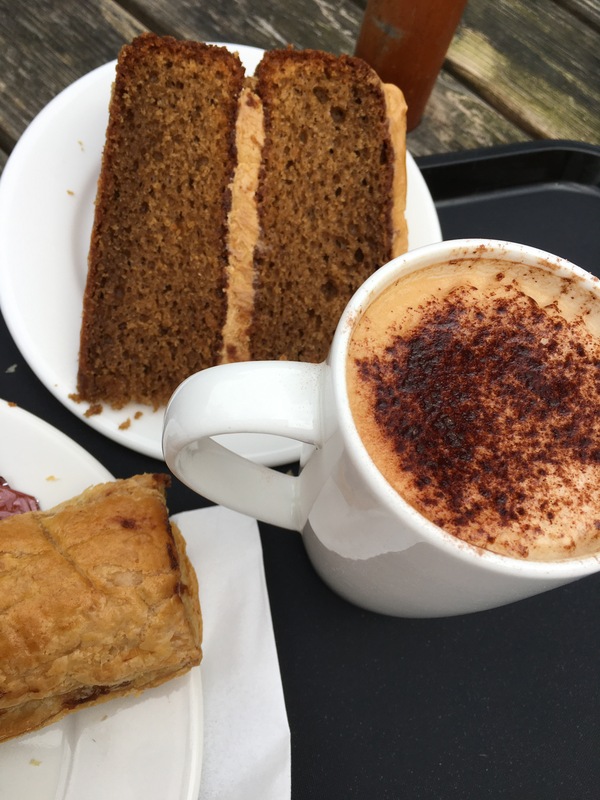 When we reached Aira Force, it was the perfect place to refuel in the cafe. I can highly recommend the sausage roll. It was nice to have a proper break. The Dorothy Gate is located in front of the café, it celebrates the writing of Dorothy Wordsworth and her influence on the poetry of her brother, William Wordsworth. 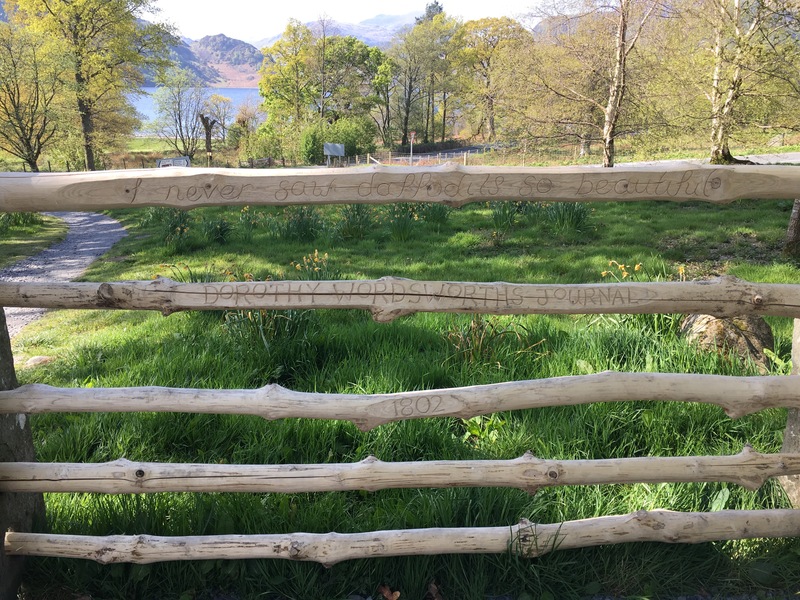 The ash poles have been carved with words from Dorothy Wordsworth’s journal by local craftsperson James Mitchell – describing the beautiful daffodils she saw as she walked along the shores of Ullswater. From here to Glenridding the path is close to the lake shore and very easy walking, passing the spot where Wordsworth saw his inspiring daffodils at Glencoyne Deer Park. The newish path from Aira Force is a welcome addition with only a tiny bit of walking on the road as you get nearer Glenridding. 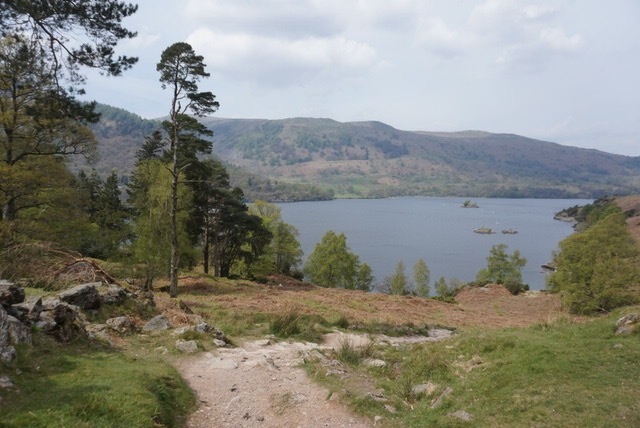 I have walked the next stage of the walk from Glenridding to Howtown several times over the years. It is funny how you don’t notice things. 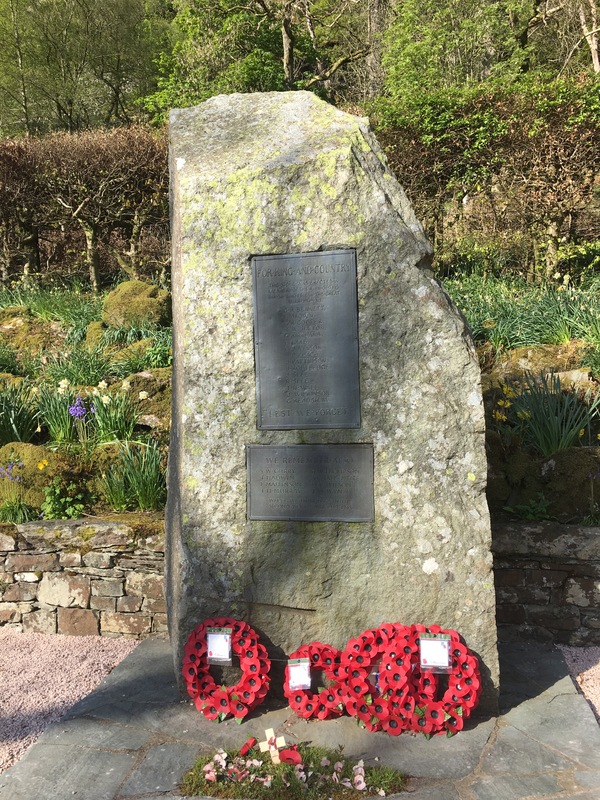 Like the Patterdale Parish War Memorial, towards the end of the First World War the inhabitants of Patterdale collected money in order to establish a permanent Monument as a Memorial to the Officers and Men who fell in the Great War. Just along from here is St Patricks Church, according to tradition, St Patrick came to the southern shores of Ullswater in about 540AD, after his boat became stranded on the Duddon Sands. 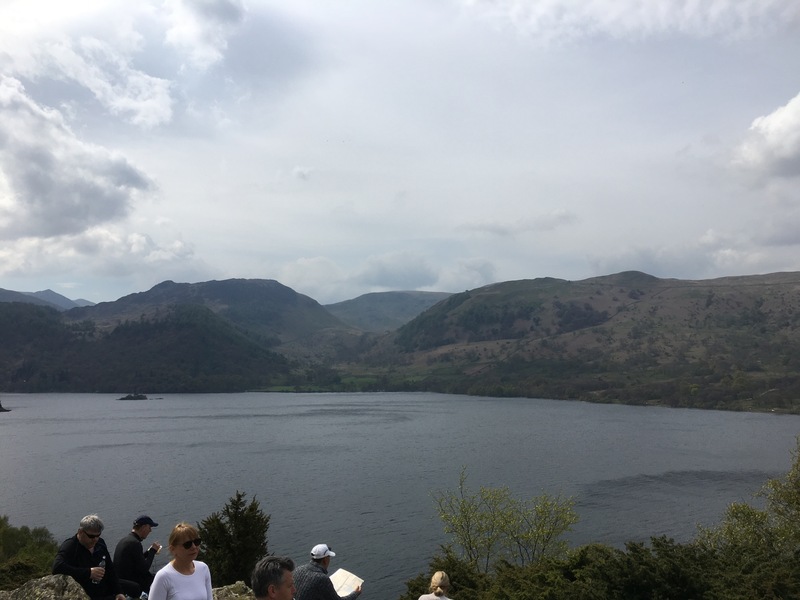 He is said to have converted many local people to Christianity and on the Ullswater Way between Patterdale and Glenridding, not far from the War Memorial, is St. Patrick’s Well, where the baptisms are alleged to have taken place. St Patrick gave his name to the area, with Patricksdale being shortened to Patterdale over time. Other famous people who have worshipped at St. Patrick’s Church, include Wordsworth, Coleridge, Southey, Ruskin, Turner, Tennyson, and Charles Darwin. 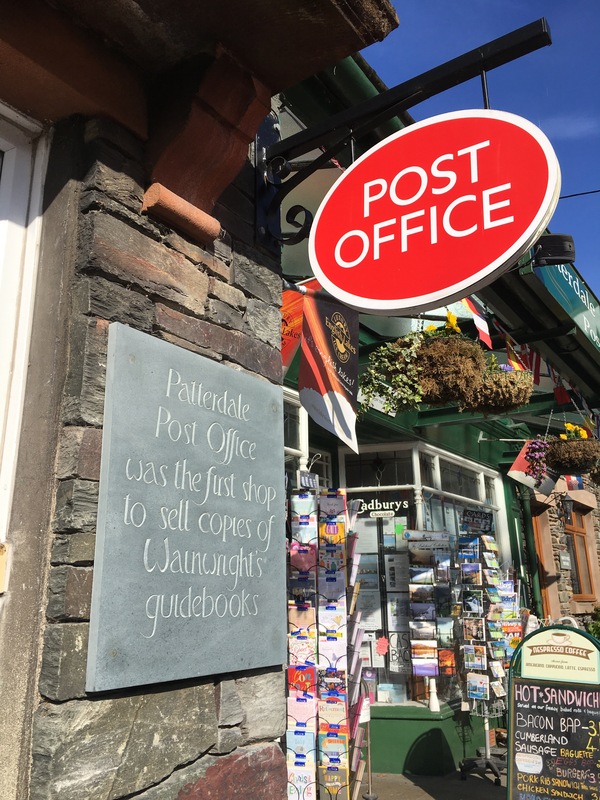 Though you don’t walk down as far as the Patterdale Post office, this is the first place Wainwright sold his pictorial guide books. The path continues round the south end of the lake and along the more remote eastern shore. It is a decptively hard bit especially as you get near the hamlet of Sandwick at the foot of Martindale. The tree roots are a killer after being so long on your feet. 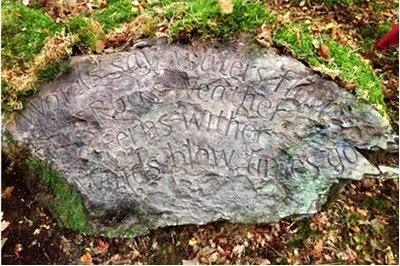 Nestled in the woods are the Poetry Stones. The lines inscribed on three rocks are from two poems by Kathleen Raine, who lived in Martindale during the 1940s. 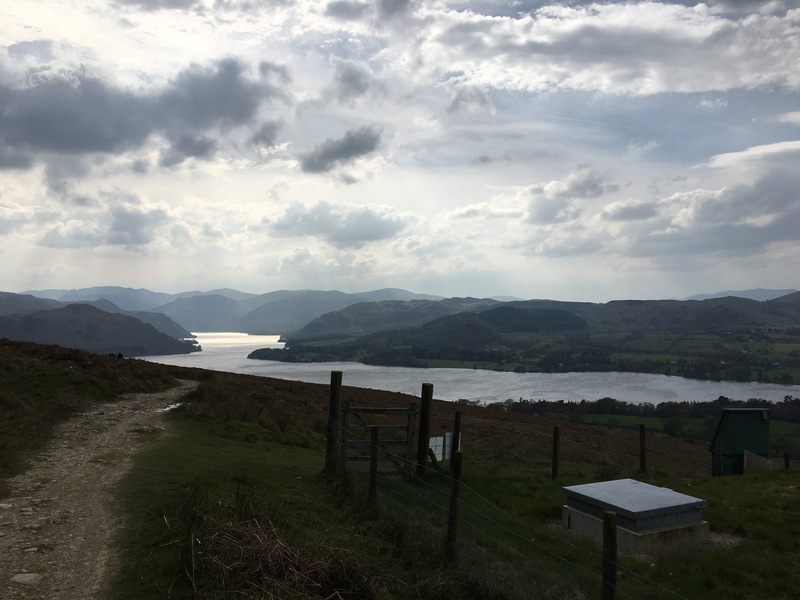 Alfred Wainwright described this walk from Genridding to Howtown as “the most beautiful and rewarding walk in Lakeland”. The final section offers a low-level option through farmland along the lake shore, or an ascent to The Cockpit, a stone circle on the northern slope of High Street before reaching Pooley Bridge at the end of the lake. We did the higher ascent via the stone circle, we were tired by this point so didn’t really appreciate the stone circle. 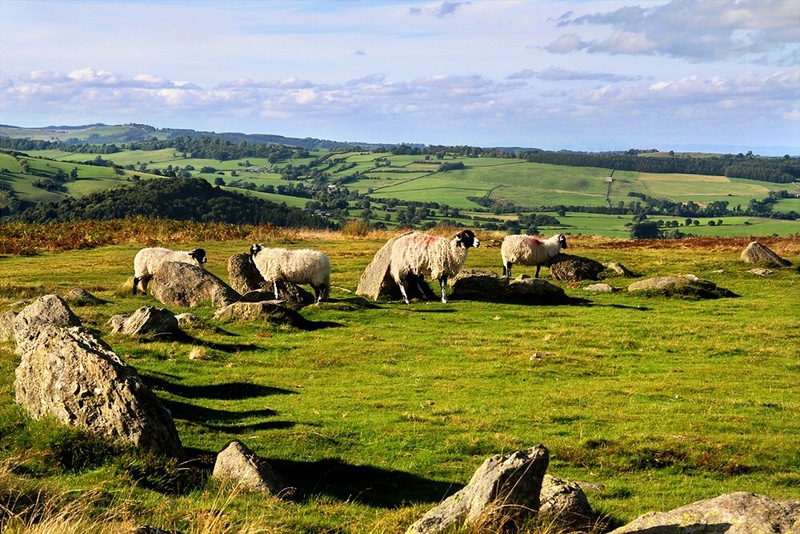 Askham Fell and Barton Fell have more than 100 Bronze Age sites and Cockpit Stone Circle is the most obvious and the most well known. 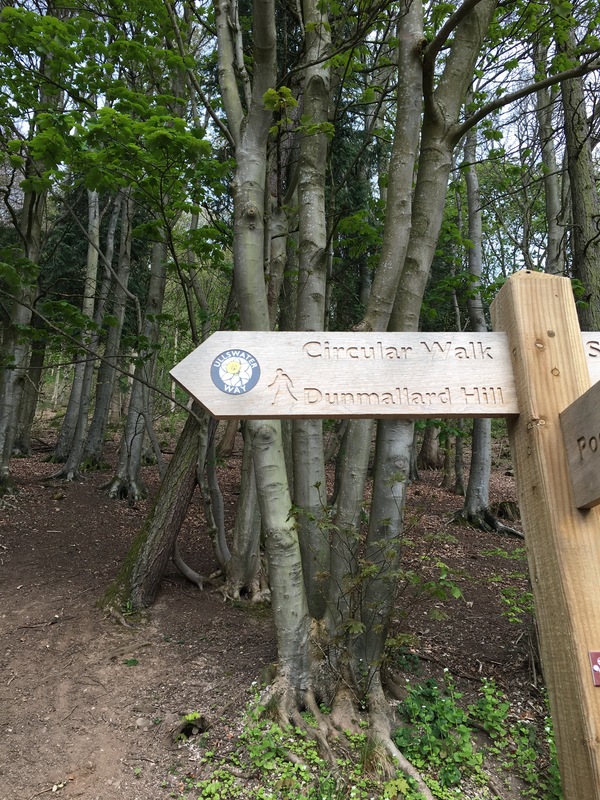 On the way up there is the Roman seat, a curved stone seat, built by local craftsman George Allonby along with David Buchanan, designed to reflect the history of this area. The grassy path turns into a tarmac road as we see Pooley Bridge coming into sight. I had never noticed the fish monument in the square. 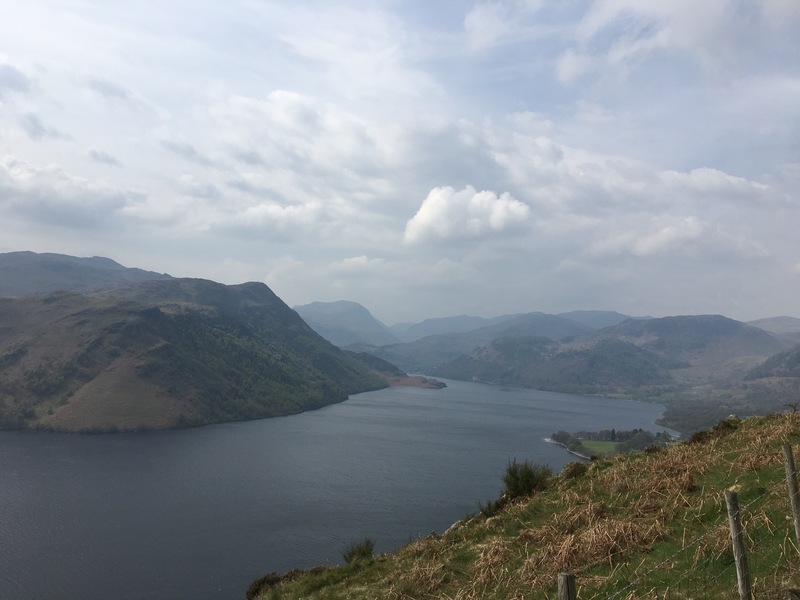 About a thousand years ago, before the village of Pooley Bridge existed, several farms were strung out along the fell sides on either side of Ullswater and the River Eamont. As the need arose for a river crossing a weir was erected between the lake and the present bridge. This, in turn, gave rise to fishing activities and the beginnings of the village. 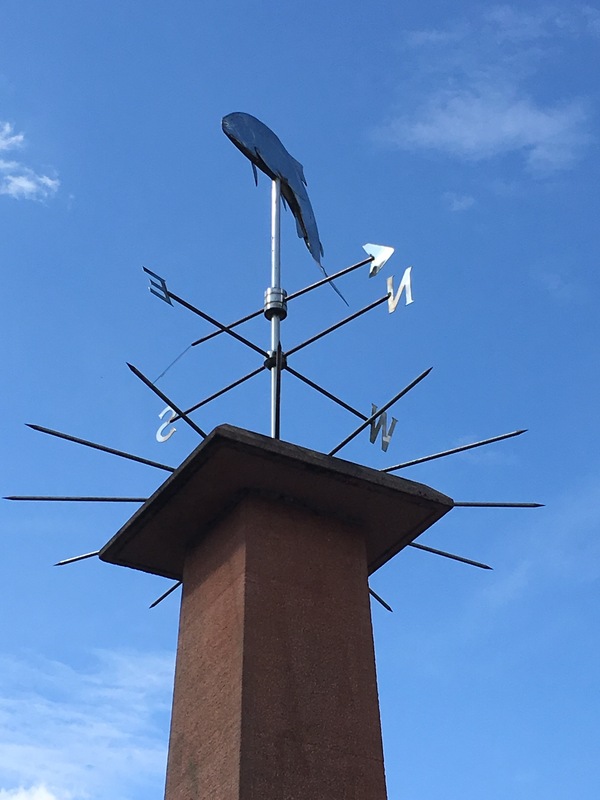 The Fish Cross monument was erected by Barton Parish Council in the Millennium Year 2000 to commemorate the granting of the charter by King John and as a reminder of the village’s fishing origins. All in all a great walk around one of my favourite lakes, definitely earnt the pint in the Sun Inn afterwards. Well written Gina, I missed the Dorothy Gate. 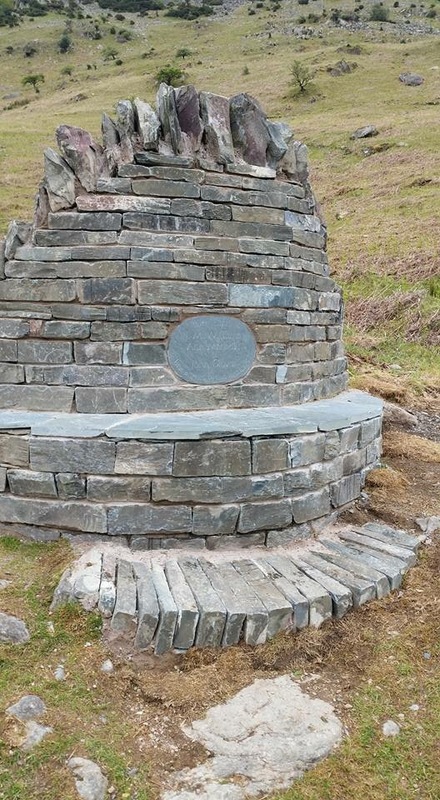 There is now a new stone on the route up to the cockpit, it is a relief map of Ullswater. Makes me want to put on my walking boots. Thank you for the inspiration. What a fabulous walk, so glad to have discovered it via Jo. I’ve not been to the Lake District for years . .this walk (and the sausage roll) makes wish I was there now!